The lives of Robert Schumann and Norbert Burgmüller intersect in fascinating ways. Both were born in 1810, and both spent significant periods of their lives in Düsseldorf, which is how Schumann came to orchestrate the Scherzo of Burgmüller’s Symphony No. 2 in D major, Op. 11. Acclaimed pianist Alexander Lonquich has long been intrigued by the complex interrelationships between these two composers and their circle of influences. Lonquich brings his unique and scintillating insight to this performance of Schumann’s Piano Concerto in A minor, a work which began life as a Phantasie for the composer’s wife, pianist Clara Schumann, but was later augmented to become an irresistible full-length work. The conversational principles of the concerto’s first movement are taken even further in the central Intermezzo, in which Schumann creates a sense of intimate dialogue enhanced by the delicate, almost chamber-like treatment of his orchestral forces. We then tumble effortlessly into the finale, which is full of subtle touches that reveal a composer at the peak of his powers: there are no perfunctory finale fireworks, but rather a movement of quirky good humour and perfectly-judged invention. Burgmüller’s Second Symphony unfolds with charming ease, undulating between genial lyricism and stormier interjections reminiscent of Beethoven’s ‘Pastoral’ Symphony. The work culminates in the Scherzo, a tussle between a refined dance, perhaps representing the civilised aspects of humanity, and sudden torrents of sound reflecting the irrepressible forces of Nature. 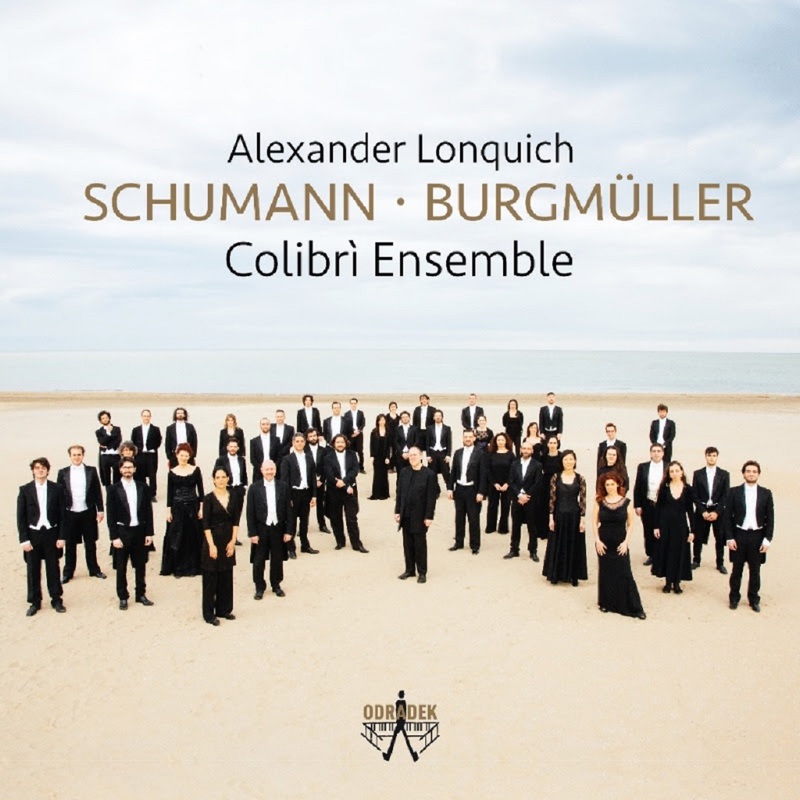 Alexander Lonquich is joined on this disc by The Colibrì Ensemble, a chamber orchestra which performs regularly in Pescara, Italy, where it has its own concert season. 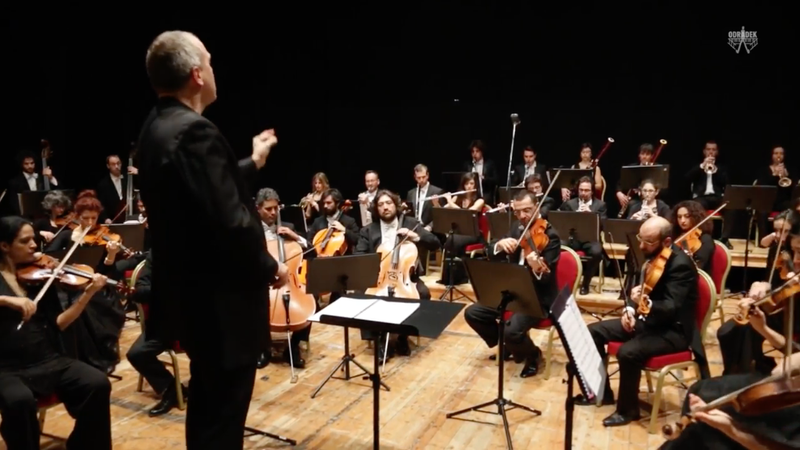 Founded in 2013 by Andrea Gallo, this vibrant collection of musicians has already forged strong relationships with a host of outstanding artists, including a special connection with Alexander Lonquich, who is now a regular guest each season. Succinct yet profoundly expressive, deceptively simple and staggeringly beautiful: Frédéric Chopin’s Nocturnes and Preludes are some of the most revered compositions in the classical music canon. 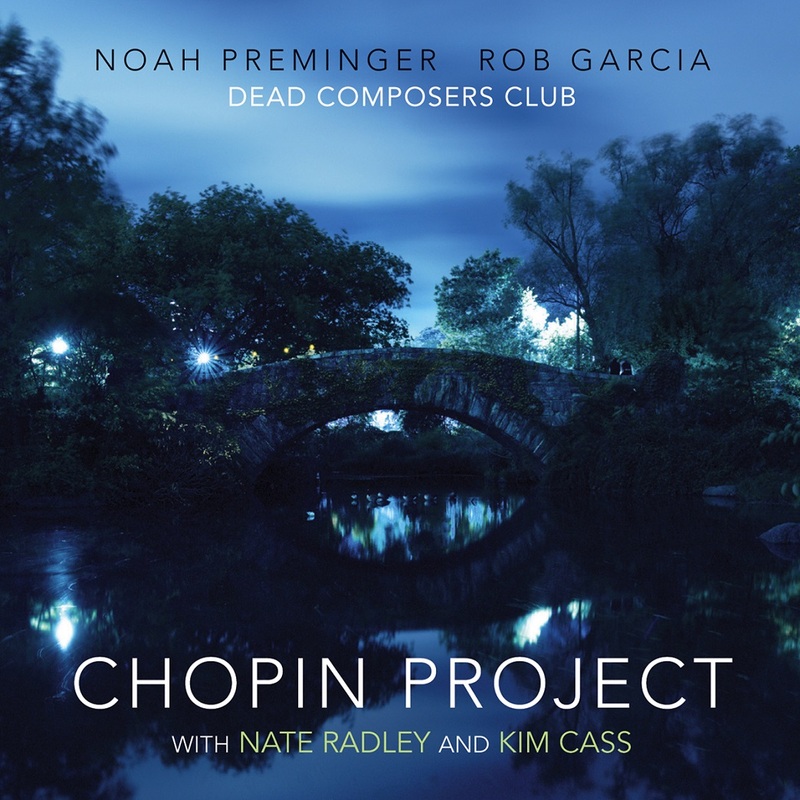 Make that the whole of music, as saxophonist Noah Preminger and drummer Rob Garcia prove on Chopin Project, the debut release by their co-led project Dead Composers Club, out May 18 via Connection Works Records. The quartet – which also features guitarist Nate Radley and bassist Kim Cass - approaches these timeless works with a vitality and urgency that connects these stellar modern musicians with their 19th-century source, regardless of elapsed centuries. The inspiration for the project came to Preminger during a rare late-night listening session – the ideal setting for a close study of the Nocturnes in particular. In recent years the saxophonist has focused his musical attention far more on output than input, and when he does dust off the headphones it tends to be to listen to the Mississippi Delta blues classics that inspired his stunning 2016 album Dark Was the Night, Cold Was the Ground. Though the elegance of the Nocturnes and Preludes would seem to be the polar opposite of these raw early blues recordings, there’s more soul to Chopin and more grace to Skip James and Blind Lemon Jefferson than a surface listen might imply. In part, the success they achieve in meeting that goal stems from the considerable histories shared by the band’s members. 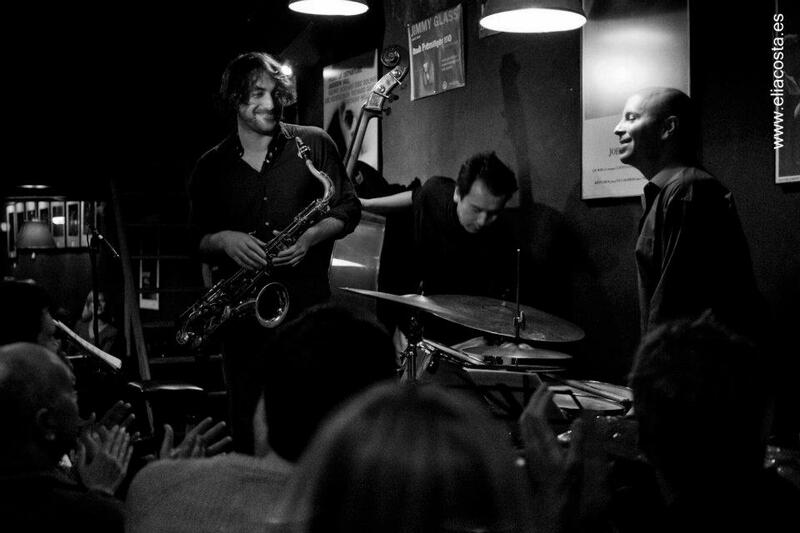 Preminger and Garcia first met on a gig with trumpeter John McNeil nearly a decade ago, and since have toured and recorded regularly with Garcia’s critically-acclaimed quartet. Cass is a regular in Preminger’s bands while Radley has played with both leaders in a variety of situations. With that familiarity to build on, the four entered the studio and played the music entirely live in one room, without the safety net of edits or overdubs. That immediacy is palpable despite the intricacy inherent in many of the pieces. The stories gathered here range from the brooding “Nocturne Op27 No.1 in C# minor,” which opens the album amidst a storm of rumbling drums and ominously droning bass; to the wistful “Prelude Op28 No. 9 in E major, which closes the album with Preminger’s resilient tone flowing over gently loping rhythms. 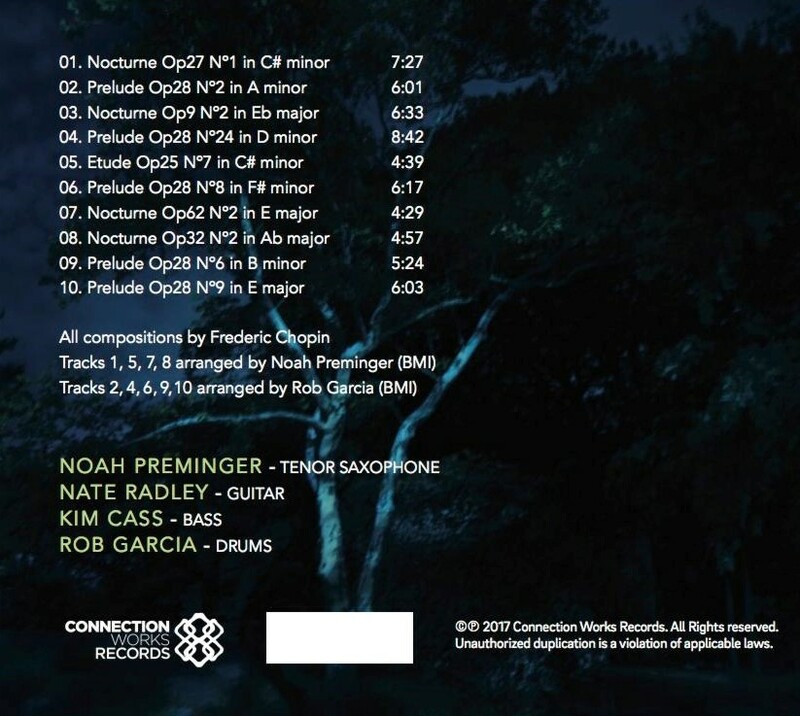 Mysteries abound in “Nocturne Op9 No. 2 in Eb major,” while “Nocturne Op62 No. 2 in E major” becomes a stunningly lyrical ballad countering Preminger’s moaning tenor with Radley’s plangent strings. The driving momentum of “Prelude Op28 No. 6 in B minor” displays the same steely resolve that ran through Preminger’s recent protest album, Meditations on Freedom, combined with the coloristic percussion that characterizes Garcia’s compositional work. 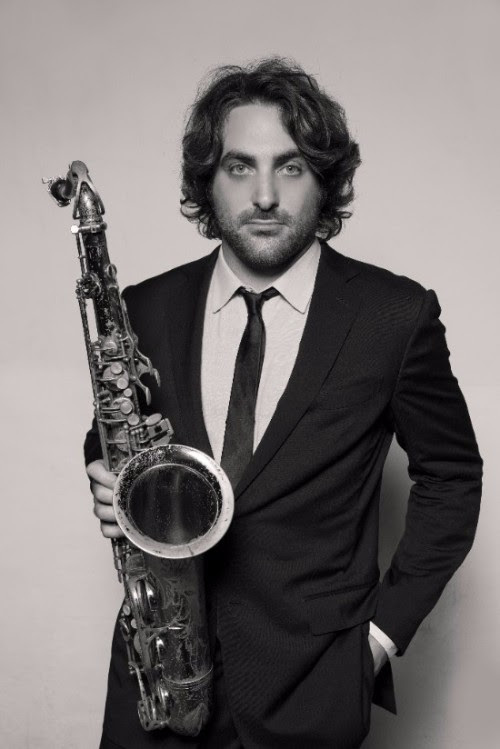 A native of Canton, Connecticut, Noah Preminger released his debut album, Dry Bridge Road, shortly after graduating from the New England Conservatory. He has since recorded more than ten critically acclaimed albums as a bandleader and is steadily listed among the top tenor saxophonists by critics and readers on the annual DownBeat Poll. Two new recordings were released in 2016, including an all-ballads date on the French vinyl label, Newvelle Records, and a recording inspired by Delta Mississippi Blues musicians, Dark Was The Night, Cold Was The Ground. On Inauguration Day, 2017, Preminger released Meditations On Freedom, a musical protest against ominous political developments in America. Preminger has also been featured in bands led by Fred Hersch and Cecil McBee, and recorded four albums for Brooklyn Jazz Underground as a member of the Rob Garcia 4. 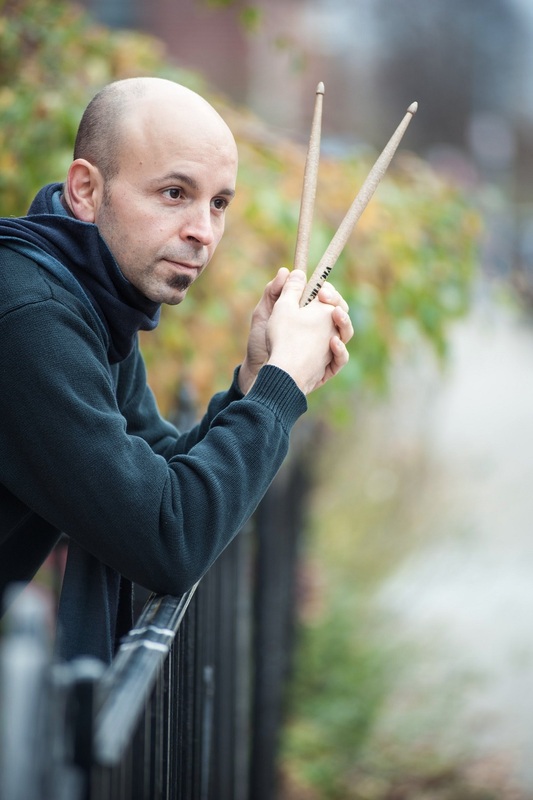 A prime mover in the current Brooklyn jazz scene” (Time Out-New York) and "one of New York’s great jazz drummers and composers” (Capital New York), Rob Garcia is a strong presence in the New York and international jazz scene as a sideman and bandleader. He has collaborated with such stellar artists as Joe Lovano, Sheila Jordan, Dave Liebman, Wynton Marsalis, Diana Krall, Myra Melford, Joseph Jarman, Anat Cohen, Vince Giordano, Reggie Workman, Bill McHenry, and Wycliffe Gordon. He has played on over 40 albums including Grammy winners. Rob has released si critically acclaimed albums as a bandleader, featuring such artists as Noah Preminger, Dan Tepfer, Gary Versace, Joe Martin, John Hebert, Dave Kikoski and Mike Formanek. His CD Perennial was named one of the 10 Best Jazz Albums of 2009 in the New York Observer. His most recent album, Finding Love In An Oligarchy On A Dying Planet, includes guest appearances by jazz legend Joe Lovano and vocal sensation Kate McGarry. Rob has received grants from Meet The Composer, DCA and NYSCA and been a major force in artist-run jazz organizations as the founder and artistic director of Connection Works, a member of the Brooklyn Jazz Underground and a founding member of the Douglass Street Music Collective.